Office of the Prince of Peace - Stained Glass Inc. 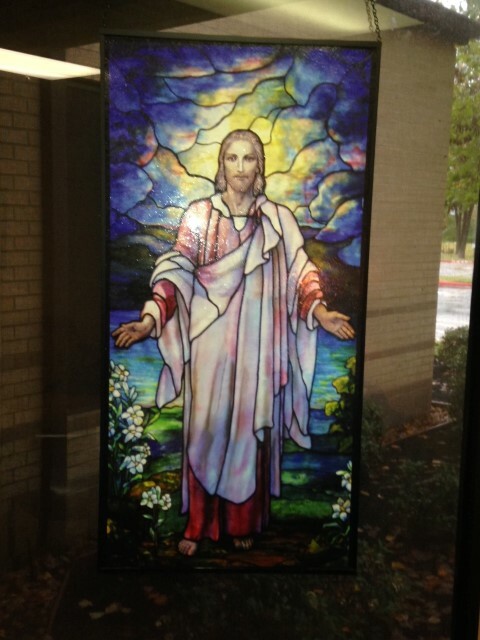 The Director of Pastoral Care of a “super” parish in Northwest Houston contacted Stained Glass Inc. to create a one-of-a-kind hanging stained glass suncatcher for his office. Deacon Kenneth, who often councils those who are troubled or grieving, has a running theme in his office that represents hope, forgiveness and God’s love. This theme is symbolized by large paintings by artist Thomas Brashear featuring Christian images. Deacon Kenneth felt that the addition of stained glass would add further promise and an encouraging atmosphere to his work space. Deacon Kenneth chose a Tiffany style representation of Christ from our online stained glass gallery. Stained Glass Inc. then worked on the design and sent him a full color proof that was approved before the artwork went to production. After approval our stained glass artists crafted a 24" x 48" hanging stained glass window panel. The suncatcher was framed and attached to a lightweight chain for hanging. Once received, Deacon Kenneth easily hung his custom made hanging stained glass panel in a 4'; x 6'; west facing window. It worked out very well,” he said, “many people have stopped by the office because of the way the sun shines through the stained glass.